This excerpt from A Pale Blue Dot was inspired by an image taken, at [Carl] Sagan's suggestion, by Voyager 1 on February 14, 1990. As the spacecraft left our planetary neighborhood for the fringes of the solar system, engineers turned it around for one last look at its home planet. 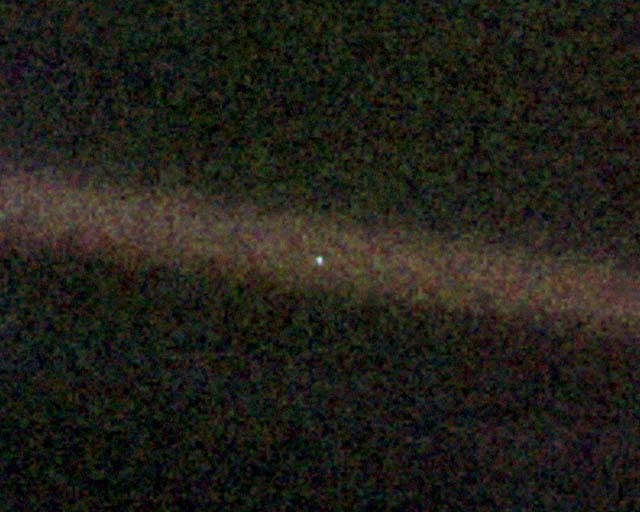 Voyager 1 was about 6.4 billion kilometers (4 billion miles) away, and approximately 32 degrees above the ecliptic plane, when it captured this portrait of our world. Caught in the center of scattered light rays (a result of taking the picture so close to the Sun), Earth appears as a tiny point of light, a crescent only 0.12 pixel in size. I tried several times to write an introduction for this, but Carl Sagan's words speak too beautifully by themselves; there's nothing I can add. Except to echo, Look again at that dot. I want to muse a little about the doctrine of no self, since it's a central theme of Buddhism and what got me interested in the philosophy in the first place. "I think, therefore, I am" is a well known quote; even the average layman will quote this famous line from Descartes without realizing the profound philosophical statement they are making. Called "Cartesian" philosophy, this idea that there is a centralized "I" somewhere deep within the brain, some sort of "ghost in the machine," is a foundational tenant of almost all Western thought. Certainly the idea of an indivisible soul is central to all Western religions. The argument sounds convincing enough, on the surface. I thought it was quite brilliant, when I first studied Descartes. The idea is that, if one doubts one's own existence, the very fact that there is an "I" doing the doubting proves that "I" therefor exists. And I will grant that, in the conventional, everyday speech kind of way, it is true. If I don't exist, who's typing this right now? So there seems to be a built-in argument--a kind of obvious rebuttal--of the notion that the self is an illusion. The Buddhist, however, would not argue against this subjective sense of self, though (nor would a naturalist, for that matter). The sense that there is an "I" sitting in the pilot's seat behind our eyes, thinking, pondering, making decisions, is very real. But it's a trick, an illusion. The implications are troubling for anyone who clings to the notion of Free Will, but are quite profoundly empowering for someone who has moved beyond such Cartesian notions. The doctrine of no self is central to Buddhism because it is a powerful motivator of compassion and a reducer of suffering. When we believe that every man is a Free Agent, that he has the power to make any choice he wants, it becomes easy--perhaps necessary--to condemn those who make "evil" decisions. "If the terrorist has Free Will, why didn't he just choose not to hurt anyone? I never choose to hurt anybody!" we tell ourselves. But if we stop to consider that the terrorist is a product of his surroundings, his upbringing, his genetic dispositions, and so many millions of other influences, it is easy to realize "there but for circumstances I go." When we believe that we are Free Agents, the ultimate cause in our line of causation, and we make choices that create suffering (in ourselves or others), we beat ourselves up, we become self-loathing. But if we are able to consider the chain of causation (as much as we can see) that led to that decision, it does not absolve us of responsibility, but it empowers us to then influence that chain to create the influences we want--a feedback loop that we can direct. And the same goes for the above case of the terrorist--when we look at the causes, we find that you cannot beat someone into changing with violence; that path is ultimately self-defeating. We have to change the factors. I attended my first Buddhist meetup this afternoon. I've been reading up on Buddhism for a while, listening to hours and hours of lectures on podcasts; but I'd never actually met other Buddhists before. I was a little nervous, wasn't really sure what to expect. I was pleasantly surprised. There was no spiritual mumbo jumbo, no new agey talk of karma or nirvana or any such (which is as it should be, but I was a unsure, since they were meeting in a Universal Unitarian church). Aside from the meditation--which was good, because, surrounded by other people, I couldn't fall asleep or get frustrated and walk away when I couldn't instantly still my mind--the group leader read some quotes from Thich Nat Hahn about anger, and we did a little meditation on anger (which just means introspection--nothing fancy). It reaffirmed to me the purpose of my exploring Buddhism--it's about introspection. So much of what we do, what we feel, goes unexamined in our lives. If we stopped to really think, take a good hard look at ourselves and ask "why am I doing this? why am I feeling this? ", we'd see how often our thoughts and actions are childish. And, by childish, I mean they're instinctual; they're unintellectual. Buddhists often call it our "monkey mind," and if you've ever spent any time watching monkeys, you'd know how apt a description it is. We are really not all that different from our cousins, the non-human primates; a lot of the difference, really, is more nurture than nature (and here is a beautiful [if somewhat poor quality] video illustrating that point). It's easy, sometimes, to slip back into that frame of mind; it takes no effort. Don't consider that the car in front of you may have a sick grandma, or a sleeping child, they're going too slow, dammit! Don't worry that the project you worked on so hard at your job got scrapped because of monetary issues, you're upset so you're going to take it personal and get pissed off! We all know better, really. So it helps to have someone remind you, sometimes (at the right time--a sage lesson while you're pissed off probably won't be received too well!). At the sangha earlier this evening, we were reminded to look at the roots of what makes us angry, what makes other people angry; we were reminded that anger tears down relationships, it destroys happiness. And then we were asked to meditate on it; which simply means to think about it, ponder it, roll it over and over in your mind until it sticks a little better. Our brains are used to absorbing so much useless information throughout the day, it becomes a survival mechanism to let things flow in one ear and out the other. By choosing to focus on certain concepts, certain modes of thought, I'm in the process of training my brain to not discard these kinds of thoughts. Next time I get angry and I suffer the temptation to let my monkey mind take over, I've got a slightly better chance of stopping, taking a look, introspecting. That's all I can ever really hope for, I guess: increasing the odds. My brain is flesh; it's monkey flesh and its reptile flesh and even older stuff all coded in over billions of years... all competing with just a few thousand years of culture. And most of the culture is crappy, too.